Doctor Totzke received her first dental degree in 1986 from the University of Santo Amaro School of Dentistry, in Sao Paulo – Brazil. 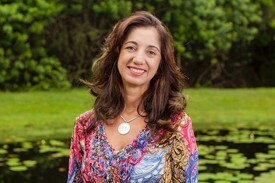 She was part of the first Graduate Class of a 2-year specialty program designed for dentists, offered at the Sociedade Paulista de Homeopatia, where Homeopathic Dentistry is in the process of being recognized as a specialty. Dr. Totzke furthered her studies in the United States, and in 1999 she graduated from the University of Illinois, in Chicago. Dr. Totzke has two sons and currently resides in the Westchase area of Tampa Bay, where she has maintained a private practice since May of 2005. In the past decade, Dr. Totzke has volunteered over 2,500 hours of her time to the local Tampa community's special events and local outreach services, (such as the Gulf Coast Dental Health Outreach Program, Give Kids A Smile Program), by providing free dental care for the unprivileged. Dr. Totzke is a gentle dentist who enjoys working with children of all ages, as well as older patients. Dr. Totzke incorporates the use of Homeopathy in her practice, which many patients who struggle to get over their fear of a dentist have found to be a very soothing component. Her “Green Office” philosophy extends to recycling all possible materials, applying fewer chemicals, and using bleached paper as little as possible. Integrating Digital X-Rays technology was done to minimize people’s exposure to radiation but also in part because it allows her to share information with specialists in a faster and less expensive way. The end result is empowering her patients with alternatives to help them make educated health care decisions. Dr. Totzke prefers to donate her time and her professional skills under the auspices of Gulf Coast Dental Health Outreach. The organization opened its doors to low-income adults in November of 2007. It is spearheaded by Dr. Robert Ettleman, who utilizes volunteer dentists to treat patients referred to the area public assistance program, expecting to reach almost 250,000 people in Pinellas County. In the past decade, Dr. Totzke has volunteered many hours to the local Tampa community's special events and local outreach services, by providing free dental care for the unprivileged.